A method for producing fibers based on a drawing by air (BB) has long been known. 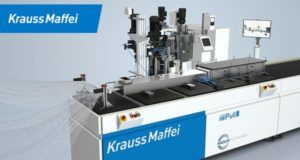 Fiber drawing method obtained relatively large length of 200 to 2000 mm, which is one of its major advantages over other methods of producing the staple fibers. Technological scheme of production method veiles draw air or superheated steam (BB) is shown in Fig. 1. The glass obtained from a glass melting furnace, flows through the die of platinum-rhodium feeder. As a result, the impact of the two jets of flat energy source (air or superheated steam) emerging from the blowing head, molten glass is drawn into fibers. In the process of producing a fiber entangled, partly and cracked in long staple fibers are deposited on a conveyor belt, forming a thin veil. The impregnated scrim binder is supplied to the drying chamber, and then using the winding device of the roll. 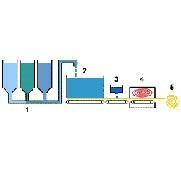 1 hopper; 2-bath furnace; 3-blowing head; 4 node preparing a binder; 5- camera voloknoosazhdeniya and collecting belt; 6-node application binder; 7 device for reinforcement glass thread veil; 8 Camera polymerization; 9-node slitting; 10 — Cross cutting unit; 11 — Drum; 12 transporting conveyor; 13 — rewind unit. Method BB may also be prepared yarns extending for producing filter fabrics, and for other purposes. 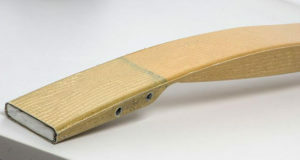 The fiber produced by this method of spinnerets furnaces.The elongated fiber suction air flow to the surface of a rotating perforated drum, and then applied to the roving frame. Wound onto a bobbin roving is transmitted to the textile processing. 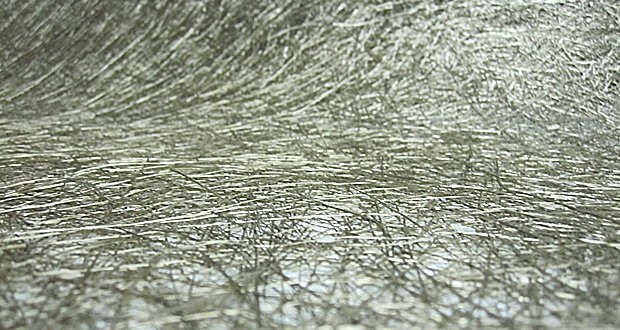 Veiles BB is a thin sheet of randomly interwoven glass fibers bonded with synthetic resins (Fig. 2). Veiles have a mechanical strength of about 20 kgf / cm2 for reinforcing veil continuous glass fibers strength is increased to 80 100 kg / cm2. At the same time, the fibrous webs are much cheaper glass fabrics. Industry produces several types of glass fiber webs. 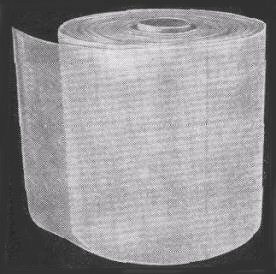 Depending on the purpose of getting fiberglass scrims tolschiny- varying from 1.5 mm for the manufacture of glass-reinforced plastics (IV-P) 0.5 mm when used as a reinforcing material for the waterproofing coating of steel underground piping (ES-T). Based veiles BB receive soft roofing materials impregnated with bitumen composition (IV-A). 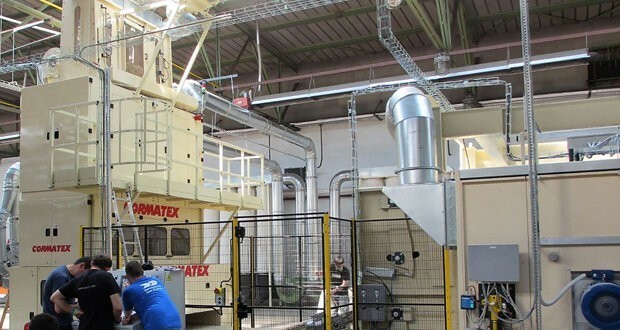 The fiber is used for the manufacture of explosives separators batteries insulating glass and paper. For the production of fiberglass and reinforcement of waterproofing veiles used alkaline glass composition, and to produce electrical securities — alkali-free glass composition. For waterproofing reinforcing glass fiber material used in combination with the bitumen, wherein the service life of pipelines is increased approximately 2-fold compared to the lifetime of the pipeline, which is used for the insulation and waterproofing Brizol. Fig. 2. fiber glass veil explosives. Technological scheme of basalt veil BB scheme is similar to glass fiber, but instead of blood vessels used heat-resistant steel plate in exchange platinum-rhodium vessel. On alloy oxide film has a high melting point, which prevents interaction with the silicate melt and exfoliate at the dynamic and thermal action. The alloy has good processing properties, high resistance and scale resistance to the molten basalt. Due to the formation of strong and chemically stable oxide films that are resistant to the melt of basalt. Made of cast billet feeder after additional machining for durability inferior to platinum-rhodium vessels as abrasive melt increases the diameter of the bushing holes. Lifetime feeder depends on the quality of manufacturing and the operator control unit, an average of 20 to 45 days. 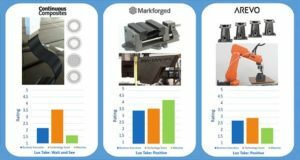 Performance is achieved on the feeder — 1 1.5 kg holes per day, it depends on the diameter of the resulting fiber. Compared with glass scrim elementary basalt fiber diameter somewhat high and ranges from 18 to 30 microns. Fig. 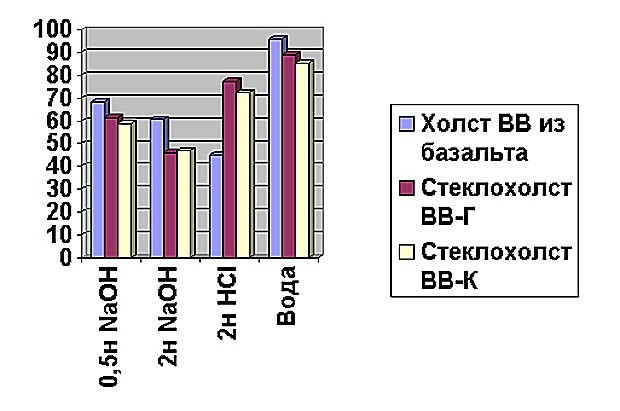 3 shows a diagram of the chemical resistance of basalt and glass fiber veil Konstantinovsky plant. It is said that by using various raw materials can be obtained on veil with the desired characteristics of chemical resistance. Fig. 3 Chemical resistance veil explosives. A new development of receipt of the canvas by direct molding (PF), a similar manner of explosives, but more economical and high performance. Basalt veil — is a nonwoven material comprised of evenly dispersed fibers. These fibers are connected to each other by means of organic additives, mainly thermosetting resins. They form a veil, which after polymerization is curled into a roll and packaged for subsequent shipment. Basalt veil unaffected by weather factors, ultraviolet radiation, the material is flexible and durable in tension, does not rot and retains dimensional stability. Along with a porosity that facilitates its good impregnability, it also has a high chemical resistance, sealing, corrosion and fire retardant properties. There are two ways to manufacture basalt veil, namely dry and wet. These methods allow to obtain different types of veil, which meet the technical requirements of many industries: the production of insulation materials, automotive industry, construction, etc. 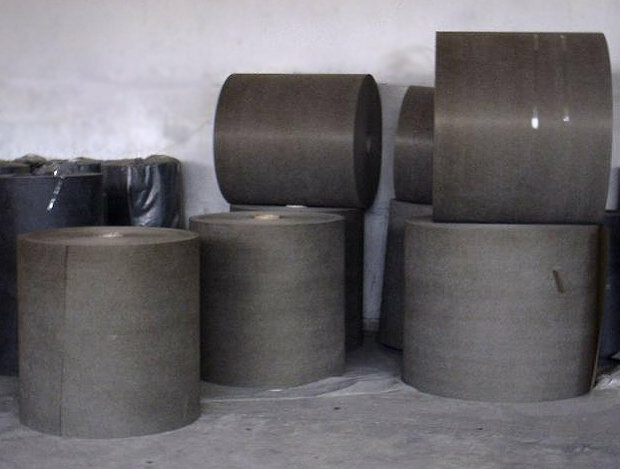 Basalt veil used as reinforcing and waterproofing material or stabilizing spacer layer material for surface finishing or for sound insulation. Fiberglass is produced from the batch, and basalt raw material is a single component and is not unimportant that, for the production of basalt canvas not require precious metals. 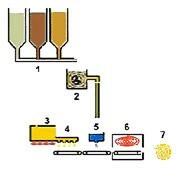 Depending on the purpose can be made different types of basalt fiber webs (Fig. 4), which are best and most effectively satisfy the demands of industry and construction. When manufacturing basalt veil a can be used various binders based on phenol-formaldehyde resins, melamine, latex, urea formaldehyde, polyvinyl alcohol and so on. They vary depending on the specific technical requirements: peening, stabilization, coating, etc. The amount of binder can be varied and its content ranges from 10 to 30%. Good chemical resistance basalt canvas expands the scope of the material, it can be used as a geotextile, and millions of kilometers of built and reconstructed both road and rail. Today is used for road construction in the CIS geotextiles on an organic basis, but they have a limited life, as methods for their production are not always environmentally friendly. The European Union is gradually moving to the so-called «green building», the use of materials of natural origin and environmentally friendly — as is the basalt fiber. The tensile strength of basalt fiber over steel 1800 — 2500 MPa, respectively, which makes products out of it to withstand heavy loads. Roofing materials based on basalt fibers have a high wear resistance, are not critical to the conditions of freezing and thawing, which is important with the application of them in the northern regions. There are a large number of applications for nonwovens. They are used in the construction of ground structures, foundations, landfills, the construction of roads and tunnels, as well as hydraulic engineering, and everywhere they perform important functions such as separation, protection, filtration and drainage. The material does not rot, fungus and mold exposure, rodents and insects, root penetration.